Confirmed number of guests is needed two weeks before arrival, together with 30% deposit. Do you want to enjoy your stay the best way possible, but not pay too much? Come to Fleda! Fleda is a pulsing place, low-cost, but cozy, with all the facilities a backpacker needs, and many opportunities to have fun around. What is the atmosphere like? Hostel Fleda is a place where history meets the present day - here you can feel the breath of the old days together with the contemporary rhythm of the city. How is this possible? Situating a centre for free-spirited travellers and the most modern venue for musicians in a building which used to house an art nouveau cabaret did the trick. Old and professional. Hostel Fleda is the oldest hostel in Brno, but has been completely reconstructed this year. We have pulled together all our professional experience, improved the place the best way we could and are ready to fulfill all the travellers needs and wishes like never before! Where is it? 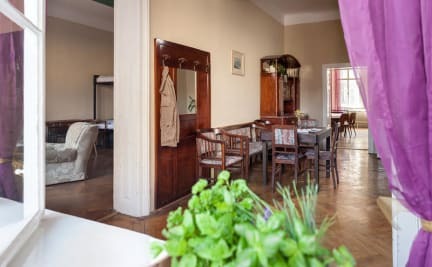 Hostel Fleda is located close to the city centre and the most popular attractions: it's five minutes by tram or fifteen minutes walk through Luzanky, the oldest park in the city, a very popular place to have a picnic or play a game. The famous UNESCO-listed Villa Tugendhat is just behind this park. Whats in and around? Hostel Fleda offers both private rooms and dorms, which consists of bunk beds or single beds with good mattresses and comfortable pillows and blankets. Lockers are available in every room. Extra beds and childrens beds are also at your disposal , and pets are welcome. Sheets and towels are available for free. There are lot of opportunities to have fun in the building itself: there is a lounge and fully equipped kitchen, a courtyard balcony ideal for drinking wine or smoking a cigarette in, and in the basement you can findclub Fleda, one of the biggest and best clubs in the region, as well as Bareček, a small bar with a sunny courtyard. Hostel guests benefit from a 10% discount to the club and can have a beer or a coffee for only 20 CZK! What to do in BRNO? We aim to welcome you in the best way possible. We love the city and we will show you why! Our receptionists are always ready to recommend places to visit, or to help organise trips, booking tickets, or even show you around the sights or pubs! The Village also offers a variety of activites from barbecue parties and concerts to guided tours in or outside the city. Molto economico, ci siamo trovati bene. Purtroppo il bagno maschile era mezzo rotto e stavano sistemandolo. La nostra camera affaccia sul cortile di un pub che per tutta notte ha avuto la musica accesa al massimo, tremava tutto. Camere comunque molto grandi, pulite e comode. Volendo c'è anche una cucina con frigo, microonde, fornelli, ma non li abbiamo usati. E' a circa 10min di tram (linea 1) dal centro. Si può andare a piedi ma non è il massimo perchè non è vicinissimo. Struttura spartana, in una brutta posizione della città. Personale accogliente e disponibile, ma le pulizie delle stanze lasciano molto a desiderare. Non ai chiudeva la porta della stanza, poteva entrare chiunque. Lo sconsiglio vivamente. Non penso tornerò mai più in questa struttura.